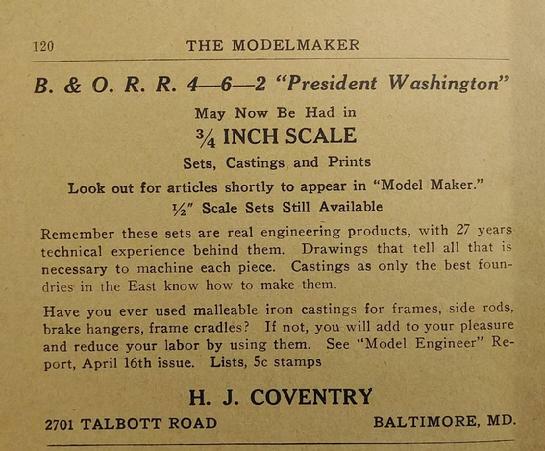 A 1931 advertisement for the 3/4" P7 in "The Modelmaker" magazine. You can buy the EXACT castings that were mentioned in this ad, and build your own P7, today.....88 years after the ad was run. The P7 "President", as built by Ted McJannett. Photo by Jim Leggett, used with permission. The original P7 "President Washington" in 3/4" scale. Built by H.J. Coventry about 1932. H.J. 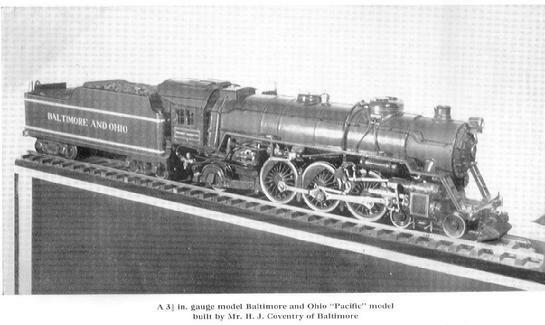 Coventry's original (1932) P-7 "President Washington", as seen in MANUAL OF MODEL STEAM LOCOMOTIVE CONSTRUCTION by Martin Evans, 1960. Compare to the other photos on this page. 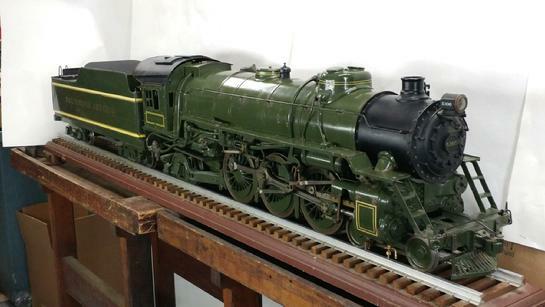 Another example of the 3/4" scale "President Washington", by a different builder, and as formerly seen in the Miniature Power Products catalog. An ad for the 3/4" P7 from 1931 in "The Modelmaker" magazine. Friends Models is pleased and honored to offer you these exact same castings, from the same patterns, 88 years after this ad was run. All castings are "sand cast" the old fashioned way at local, "neighborhood" foundries in New England, USA. 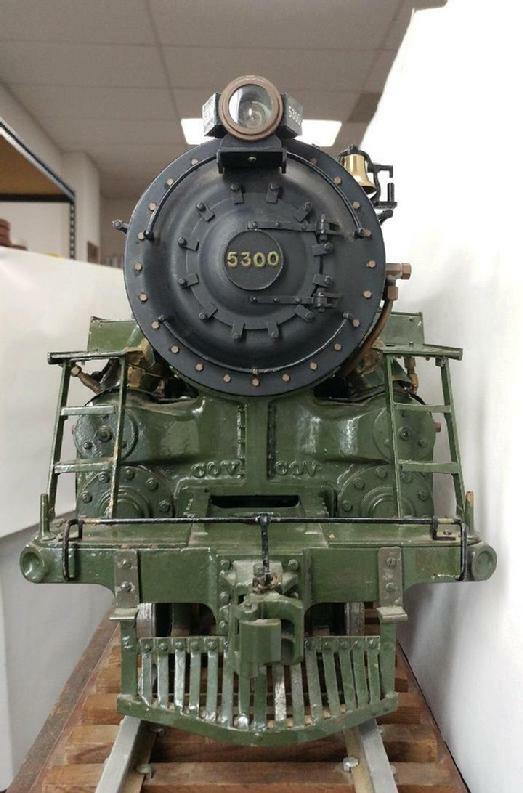 The prototype P7 #5300 locomotive was built by Baldwin in 1927 for the Baltimore & Ohio Railroad. Twenty locomotives of the class were built, and they were named after the first 20 presidents. 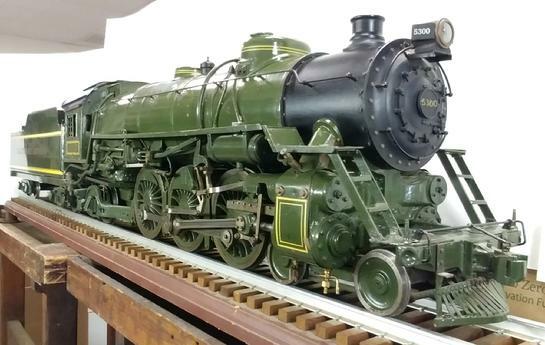 This 3/4" scale live steam locomotive was designed by Mr. Coventry in the early-1930s at the request of several live steamers who had built Mr. Coventry's 1/2" scale version of it (starting in 1928) and who wanted a larger, heavier "live steamer" to build and run. Thus the 3/4" scale P7 "came to be" and debuted in the early 1930s; it was advertised in "The Modelmaker" magazine at that time. It became Mr. Coventry's most popular and well-known design. Many examples were built and are still running today. When "Friends" acquired the design, Friends had new coring made, brand new, that would allow a cylinder to be cast that would be exactly to Mr. Coventry's original design specifications. With all complex "steps" and passages "cored in", the cylinder is able to be much-more-easily machined by "amateur" or "hobbyist" machinists, than prior. In fact it can be done on a 10" lathe with faceplate. This is the first time since the 1960s that these cylinders have been produced with this specialized coring; and the first time in decades that the cylinders are "as Mr. Coventry" envisioned & designed them. The H.J. Coventry "President Washington". This is classic 3-1/2" gauge coal-fired live steam. Front end details up close.....the smokebox front, headlight, cylinders, the front deck, the front beam, the pilot (cowcatcher), the coupler and coupler pocket. 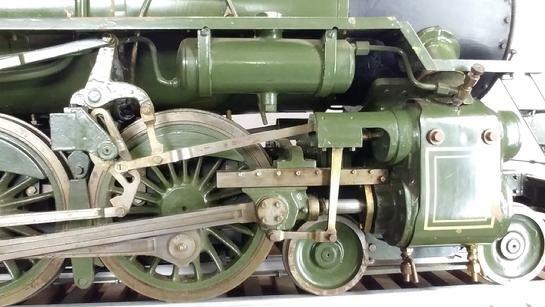 The valve gear and motion. 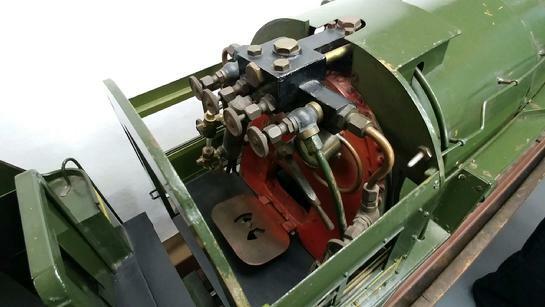 The Walschaert valve gear drives a piston valve which works in a steam chest that has all ports "cored-into" the casting, thus eliminating what was, for hobbyists, a nearly-impossible "step boring" operation in the steam chest. The P7's cab. 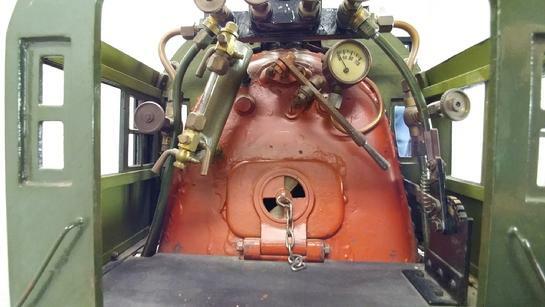 The roof removes for easy access to the throttle, blower, steam brakes, power reverse, injector, and VanBrocklin steam pump. The Power Reverse. Powered by live steam from the turret, it actually works! Power Reverse Cylinder, Steam Chest, and Guide are shown. Want to look the project over? Complete set of drawings $295.00 plus shipping. The drawings are the same quality as regular engineering drawings. Each component is completely detailed, so as to avoid any confusion, or difficulty in interpretation. For shipping outside the USA, please contact me for payment details. Friends Yankee Shop Models ships worldwide. The following is the complete list of castings for the 3/4" scale "President Washington". All are "in the rough" and require machining to blueprint specification (blueprints are available above). Castings are of cast iron, bronze, brass, and aluminum. They may be purchased in "sections", as listed below. All shipping prices are to the USA. For other countries, please inquire about shipping rates, or please make your purchase and pay the "USA" shipping rate, and I will send an invoice for the shipping balance for your country. Sections with no shipping price specified are large or heavy, and shipping will be calculated based on your address and location. For these sections, please make your purchase and I will send a shipping invoice after your purchase. Thank you! Machinery Requirements: 9" (or larger) lathe, small to medium sized milling machine, drill press, grinder, machinsts' layout tools, hand tools, etc. The complete set of approximately 120 castings in iron, bronze, brass, and aluminum are available for purchase in "sections". To purchase by PAYPAL or your credit card, click below. Money orders, personal checks, and "non Paypal" credit cards also accepted. For more information, please contact me. Two views of a different 3/4" scale HJ Coventry P7 class "President" under construction, this one back in the early 1980s. Top view shows the trailing truck, cradle, and grate. 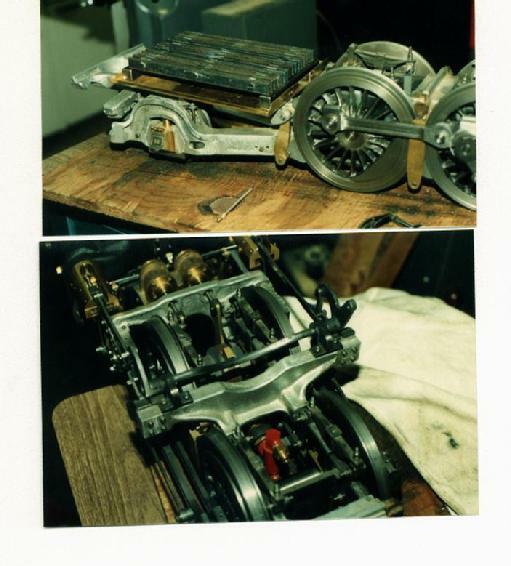 The bottom view is of the chassis as seen from above. 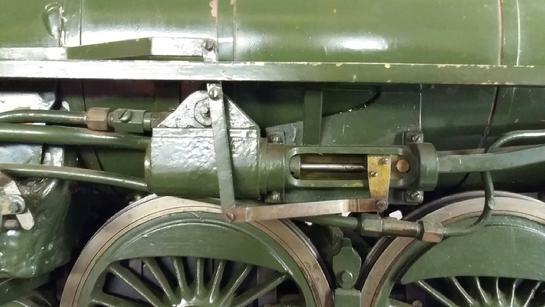 Brake cylinder, guide yoke, and motion beam are clearly seen in this rare view. This design has been successfully built by live steamers since the 1930s. The blueprints are complete in every detail, and each part is individually shown. 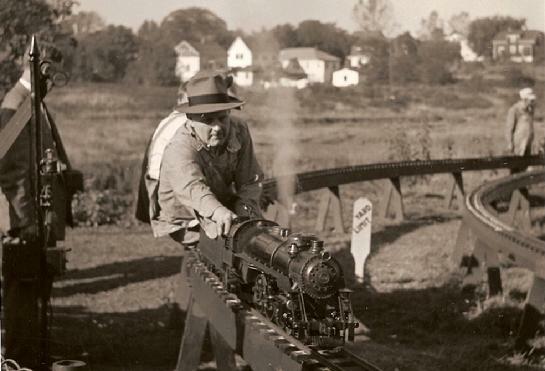 Joe Hild runs his 3/4" scale P7 class 4-6-2 Pacific "President Washington" at the New England Live Steamers track behind the Friend Box Co. in Danvers, MA in the 1940s. Donald Hills, photo. 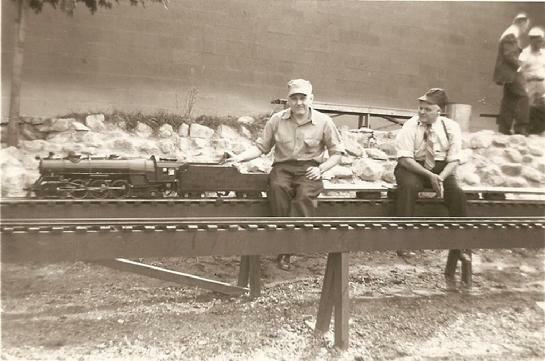 Herbert Hild runs Joe Hild's 3/4" scale P-7 class PRESIDENT WASHINGTON at Danvers, MA in 1946. Photo by Donald Hills, courtesy Robert Hornsby, used with permission. 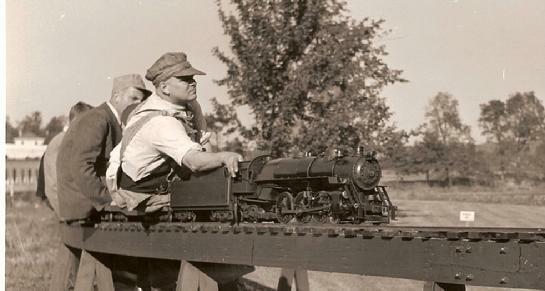 Brothers Herb Hild and Joe Hild on their 3/4" scale PRESIDENT WASHINGTON at the NELS track at Danvers, MA in the 1940s. H.J. 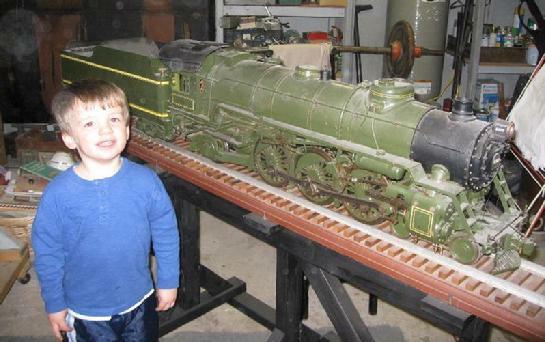 Coventry's original 3/4" scale P-7 class 4-6-2 #5300; shown here in 2009 before its cleanup for display.